The symbol of the Museum is the “Totem of Peace” by sculptor Mario Molinari. In 1997 the Fondazione Mediterraneo organised the Euromed Civile Forum in Naples,in which 2248 delegates from 36 Countries of the Great Mediterranean took part. Among the recommendations and proposed projects, there was the one “identifying a peace symbol among peoples through the work of a great artist”. 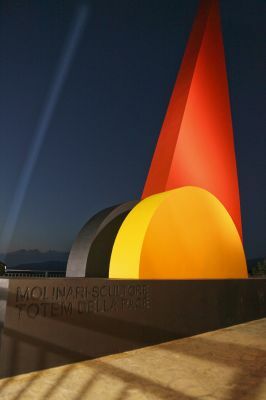 A scientific committee established “ad hoc” by the Fondazione Mediterraneo, after 10 years of work, acknowledged the work “Totem of Peace” by the Turin-born sculptor Mario Molinari, as the most appropriate symbol to represent peace in the Great Mediterranean as well as in the world as a whole. The red sail not only represents the tragedies and deaths that have bloodied the Mediterranean Sea, the Middle East region, alongside the rest of the world but, essentially, the re-birth of trust in order to re-establish a dialogue. The two yellow and orange semicircles represent the sunrise and sunset on the blue sea: a sign of joy, colour and hope for a future of peace and shared development. The Totem of Peace has already been created in various cities of the world and in different sizes (Turin, Naples, Pescasseroli, Rabat, Rutino, San Sebastiano al Vesuvio, Marseilles, etc.) and it is being developed also in other cities, including Barcelona, Amman, Marrakech, Fès, Jerusalem, Gaza, Lecce, Cairo, Istanbul, Tunis, Algiers, Muscat. The objective of the Fondazione Mediterraneo – in collaboration with the Maison de la Méditerranée, the Maison de la Paix and the Museum of Peace - is to disseminate this symbol in order to constitute the network of the “Cities of Peace in the World”. In the Museum of Peace, there are 3 samples of this work: one in enamelled steel on the Museum terrace, one in polyester in the “Memories” section and the massive work in corten steel with relics of the "Unknown Migrant", in “Coast Guard Square” in front of the Maritime Station of the Port of Naples, visited by Pope Francis on 21st March, 2015, and since then the destination of representatives of Countries and Institutions wishing to pay tribute to migrants who died in the sea in pursuit of that freedom and dignity lost at home.